Learn about common stucco problems. Although stucco is an extremely durable product, improper stucco installation can lead to catastrophic damage to your home. 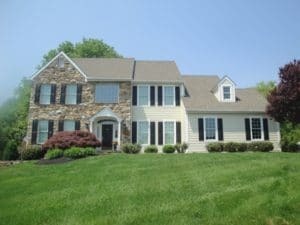 The stucco you see when you look at your home is only the outer layer of a complete siding “system.” Problems can arise at any layer of the system, and the more missing or damaged layers of the system, the more problems you will have. 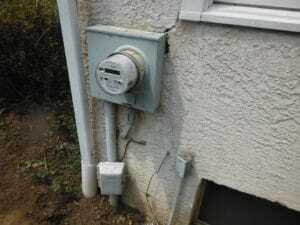 As it’s impossible to see under the stucco to know if the proper system was installed, it is also almost impossible to visually see all of the possible underlying damages without a full evaluation. 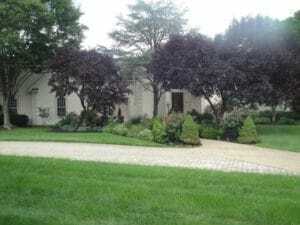 Having an expert like Ai Restoration, a company who has been remediating stucco concerns for over two decades, come out to your home to evaluate the stucco is truly the best approach. You don’t want to take any chances on allowing one of your greatest investments to start deteriorating right underneath you. Ai Restoration is capable of diagnosing the true problems and fixing just where they lie. 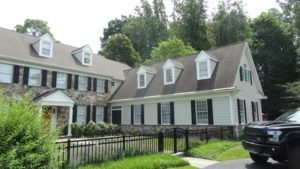 Here are a few common problems we see with stucco, and what to watch out for when you look for potential issues. Why are there stains on my stucco? 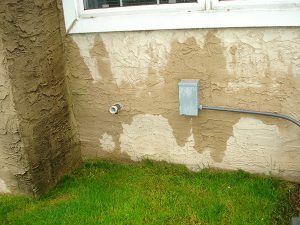 There are several possible causes for staining on stucco. 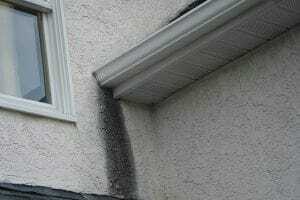 Rain water will wash down contaminants from roof surfaces and windows which will be absorbed into untreated stucco, also causing stains and deterioration. Rotted wood or deteriorating felt paper can also “bleed” out from under the stucco causing stains. In any case, stains on stucco should be addressed as soon as possible, by a professional. Are cracks in stucco normal? If cracking is localized to specific areas it can often be linked to underlying damages from sources such as water. 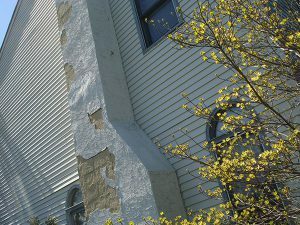 If the cracking is more general throughout, the stucco may have been improperly applied and/or done so in adverse weather. 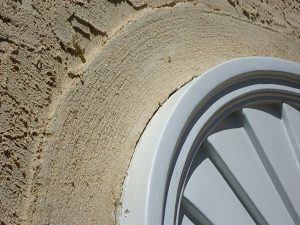 Cracking at dissimilar surfaces, such as windows, may be due to missing joint work or stop bead. Some structures may naturally experience movement in certain areas that exceed the strength and flexibility of normal, untreated stucco. How can I tell if there is mold beneath my stucco? If water is trapped behind the stucco mold will likely grow. Take a look behind pictures hanging on exterior walls, open joist cavities in the basement, open walls in the attic and look for any signs of mold or mildew. If you see any mold or mildew, these are signs of continued water infiltration. This should be addressed immediately for health safety and to prevent further damage. Why does my stucco extend below the grade? This is a sign that your stucco contractors improperly installed the stucco. When stucco extends below the grade without a weep-screed/water-management system, it creates two major problems. First, any water contained in the stucco that moves downward has nowhere to drain and will go into the house. Second, the stucco will actually pull moisture up out of the ground through capillarity (also known as capillary action, capillary rise, or wicking). Unsealed stucco will naturally age and start to deteriorate overtime. 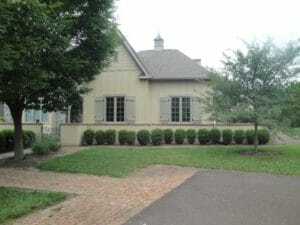 Pressure washing, improper mixing, poor installation, landscaping too close to the wall, heavy concentrations of water and more will expedite the decomposition of stucco. 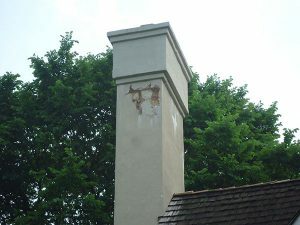 Any deterioration in stucco is a sign of underlying problems. Are water marks after rain normal? 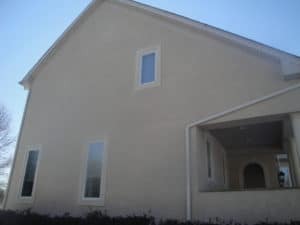 Stucco is naturally porous and can handle a small amount of water absorption. 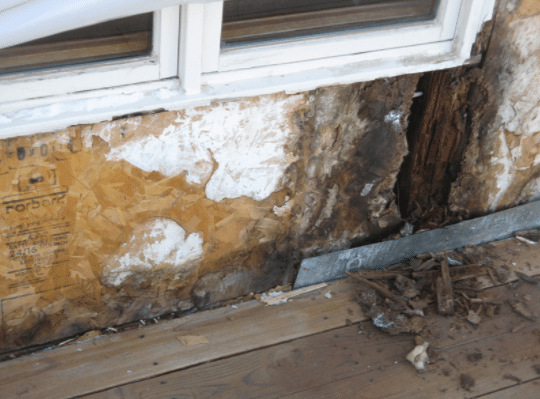 However, if the stucco is overwhelmed with water and there is inadequate drainage or airspace, the water will saturate the stucco and lead to mold and rot. 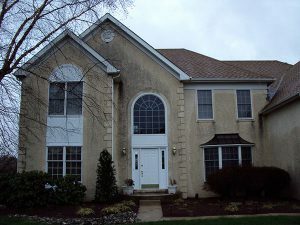 The Northeast area where we are located experiences extreme weather conditions that can easily overwhelm improperly installed stucco, which is why we stucco problems are so common in this region. What are the white marks on my stucco? Efflorescence is a mineral salt deposit. These deposits are most commonly observed as a white-looking deposit on stucco. These water-soluble salts are present in varying degrees in the materials used to mix stucco so sometimes can be considered “normal”. But they also may originate at points where the stucco meets the soil or where heavy concentration of water is against the stucco. As the water gets absorbed into the stucco, it can dissolve some of the salts and these salts get drawn towards the surface. The water evaporates, leaving the salt deposits behind. Is it bad to have space between the stucco and the door/window? There should not be a gap between the stucco and door or window. This gap can easily allow water in and cause major damage. Many times we find these areas to be the origin of large problems. Why are there only stains in certain areas? A kick-out is a small piece of flashing installed at a specific lower roof line that terminates into a wall. This area is extremely vulnerable to water infiltration and if the kick-out is missing, we’ll likely find damage in that area. 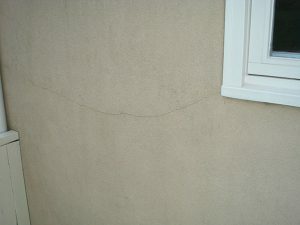 One tell tale sign of a missing kick-out is staining in certain areas (like at the end of a gutter), which appears because the high concentration of water is not properly being directed away from the stucco. We continually find these areas to hold the greatest amount of underlying damages. 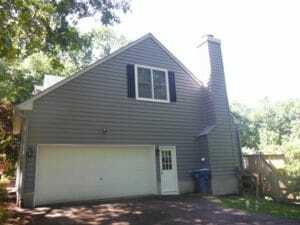 Stucco is considered a “reservoir type” exterior siding product. This means that the stucco can get wet and will hold the water until the sun comes out to dry the stucco out. 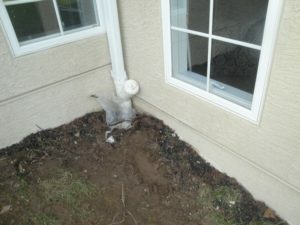 The concern is that if you have thin stucco, you have a thin reservoir which can’t hold a lot of water and can be easily overwhelmed, causing the water to seep into the house. The thicker the stucco, the stronger the stucco, and—as you can imagine—the stronger the stucco the better. What happens if there is no weep screed? The weep screed would be found along the base of the stucco on your home, it should be at the foundation sill line and/or approximately six inches above grade. The weep screed is a critical part of the system that allows water that gets in behind the stucco to come out along the bottom. 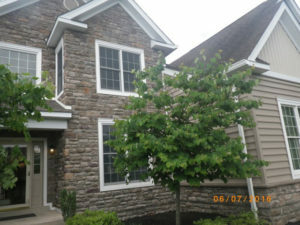 If this is missing you do not have a proper stucco system. What do control joints do? Control joints are joints that you will see mainly at floor lines, or lines between the first and second floor. These joints allow for movement and help to prevent stucco cracking. 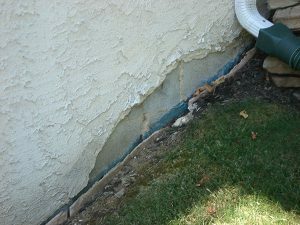 Without the joints, the stucco is more likely to crack and water will be able to penetrate those cracks.